This probably won’t be the last post about doors. These magnificent inventions have been around for a very long time and yet we cannot seem to fully understand them. We have awkward automatic doors [post coming up soon], we misunderstand what proper door etiquette really is, and the most popular human error: understanding the push/pull signs. So what to do? You pulled on the door and it didn’t open. Now you would think you know what the obvious thing to do in this situation is, but no ladies and gentlemen. We look around nervously to see if anybody saw our mistake and then we pull again. “Did anybody see me?” and sometimes we even consider that the door might be broken. 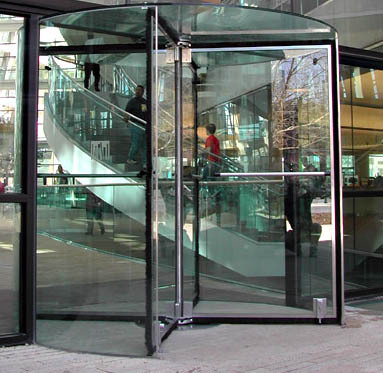 Why can’t we just have revolving doors everywhere? There are probably real reasons why we are always pushing instead of pulling. I mean, pushing is a lot easier than pulling (unless you’re a tow truck), but what I believe is a better reason that accounts for this situation is that the words look too much alike. PUSH and PULL are both four-letter words, they both begin with P, their second letter is U and they take up the same amount of space on a sign. It’s almost as those freeway signs (those of us in Los Angeles, know what I’m talking about). The words NORTH and SOUTH look the same and it can be the cause of missing the on-ramp. Fine print: This tip does not apply to automatic doors, car doors, or revolving doors. I was trying to find a picture to give you a visual of this, but I had no luck. I’ll snap a couple of pictures next time I’m out. While people awkwardly look at me. Hahahahah some people have actually done that!! The Cheesecake Factory has doors where only one side has a handle and the other side has nothing, so you have no choice but to push! They’ve got it down. In a perfect world, every door would be like that. It would save us a lot of embarrassment haha.